I started making cards this year and love it. I get my best inspiration when making a card for someone I know. 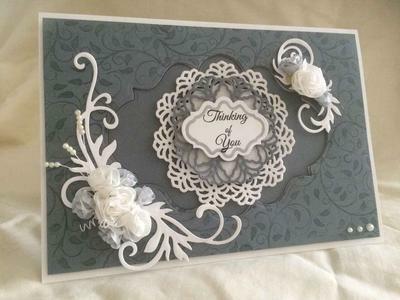 I made a card inspired by you, Christina, as I have watched all your videos on You Tube, you have taught me so much and I love your style. Pretty with flowers, ribbons and lace. I made this card and the box and was rather proud of it until I sat it on a small wooden easel in front of an oil diffuser. When I picked it up and looked it over a day or two later the back of the box had absorbed the oil and it had gone through into the back of the card too.. eckk I thought all my hard work had been ruined. I then remembered that you had shown or said that nothing is ruined and can always be fixed or altered. 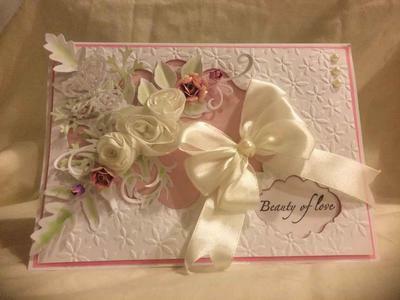 So I remade a new box base and glued on a new card back and added a die cut with sentiment into the inside of the card... result.. all better AND it smells nice too.. lol. Phew !! Thank goodness for that it would have been such a shame to throw this really pretty card away when just a little mind power can salvage it. Your cards are gorgeous. Good save. I think both of your cards are really lovely. A brilliant rescue from your mishap. Well done. 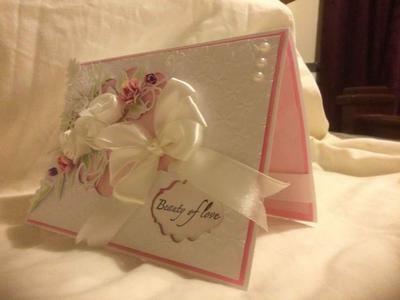 You must have been so cross when you thought maybe your card could be ruined, but it isn't and it's lovely , so there. ! What a lovely card! Even after the upset you had. Hi Erin. Your cards are just BEAUTIFUL!! Sorry about your mishap, but it allowed for more creativity. Well done. I hope to see more cards from you . Have a lovely day.